Congratulations are in order for Brandon Hurd who won our Signature Sweepstakes competition on Facebook. 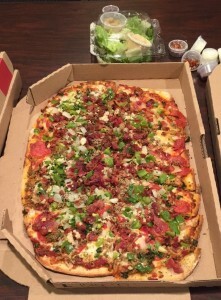 Brandon’s creation, The Big D, features pepperoni, Italian sausage, breakfast bacon, green and white onions, garlic, and bell pepper. Brandon won FREE PIZZA FOR A YEAR! Thanks to all who entered, voted, dreamed big, and ate well! Our Signature Sweepstakes Finalists have been announced! Vote for your favorite on our Facebook timeline. Winner by popular vote will be announced on February 19. Winner receives free pizza for a year! i Fratelli would like to invite our FANS to design our next Signature Pizza. Submit your entry on our Facebook page. (Hint: Creatively named pizzas will have an edge over the competition!) We will announce the finalists on February 12 to allow the public to vote for a winner. The lucky winner will enjoy FREE PIZZA for a YEAR (26 pizzas). • Free Pizza for a Year (26 complimentary pizza cards). b. Representatives and/or agents (including advertising & promotion) of i Fratelli. c. By virtue of an entry to the Contest, Participants signify their acceptance and agreement to all terms & conditions set out here. b) Participants will be asked to vote for their favorite photos posted on iFratelli Facebook Fan Page. c) Public posting period will be Jan 26-Feb 9 at 3:15 pm CST. d) i Fratelli will choose contest finalists, who will be announced on Feb 12.
e) The public voting period will be Feb 13- Feb 18.
f) The winner will be announced February 19, 2016. 5. Only the Participant(s) that fulfill the contest mechanism stated above shall be eligible to win the prize(s). Incomplete entries and/or Participants that fail to fulfill the Contest Mechanism will automatically be disqualified from the Contest without prior notice. 6. There is ONLY one winner for this Contest. 7. The winner(s) will be selected by Facebook fans, only. No correspondence will be entertained. 8. Selected winner will be contacted, at any time deemed appropriate by the Organizer, via email. 10. Winner’s name will also be announced online on the i Fratelli Blog, Facebook Fan Page and Twitter account. 11. The Organizer (including its respective employees, staff and agents) shall be held harmless and shall not be liable for any loss (including loss of opportunity and consequential loss arising therewith) and/or any damage suffered by any winner in connection with the Contest. 12. The prize is not exchangeable and/or transferable. Failure to accept prize by winner when required to do so shall constitute a rejection by such winner and the Organizer reserves its right to award the prize to another winner. Organizer reserves its rights to change the prize without any prior notice. 13. The winner is bound by the terms and conditions that come with the prize. 14. The Prize will be delivered in the form of complimentary pizza cards and may be redeemed at i Fratelli’s discretion. 15. The Organizer reserves its rights to publish or display materials or information, including but not limited to the names and photographs of all Participants for marketing, advertising and publicity purposes in any manner it deems appropriate. The Organizer further reserves its right to use any personal data of Participants in any manner and/or for any purpose it deems fit and participant is deemed to consent to such use with no monetary payment. The Organizer reserves the right to disqualify any submission for any reason based on the Organizer’s criteria with regard to taste and appropriateness.16. The Organizer reserves its right to cancel, terminate or suspend the Contest with or without any prior notice and reason. For the avoidance of doubt, cancellation, termination or suspension by the Organizer shall not entitle the Participants to any claim or compensation against the Organizer for any and all losses or damages suffered or incurred as a direct or indirect result of the act of cancellation, termination or suspension. 17. The terms and conditions herein shall prevail over any inconsistent terms, conditions, provisions or representations contained in any other promotional or advertising materials for the Contest. 18. The Organizer reserves its right to vary, delete or add to any of these Terms and Conditions and/or substitute or replace the gifts from time to time without any prior notice. 19. By participating in the Contest, it is deemed that the Participants agrees to be bound by the terms and subject to the conditions herein set out upon submission of entry. The decisions of the Organizer in relation to every aspect of the Contest including but not limited to the type of prize and winner shall be deemed final and conclusive under any circumstance and no complaint from any participants will be entertained. 20. The decision of judges appointed by the Organizer are final, conclusive and binding and no further appeal, inquiry and/or correspondence will be entertained.